When choosing your kitchen flooring options some of the first questions you should ask are how much you are willing to spend, and what you expect from your flooring. Are you looking at pure durability, or are you looking at something that will wear well, yet look great over the years? If you happen to have kids, you want to make sure that the floor is spill resistant. If you love to cook and spend substantial time in your kitchen, you want the kitchen flooring to be kind to your feet. 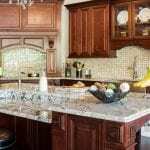 The ideal thing, of course, is to look for something that complements your cabinetry, your countertops, and your kitchen appliances, since the right kitchen flooring ideas can make all the difference in the world. We already know that the kitchen is a high traffic area, so its flooring must also withstand this traffic. With the large number of online retailers and kitchen designers, it is easy to do your research and get familiar with all the variety of kitchen flooring materials. Once you do that you can better make an informed decision about whether you want your kitchen floor to be made of concrete, vinyl, tiles, wood, laminate, travertine, granite, etc. If you want to go environmentally friendly, then you might be thinking of cork or bamboo. Read on to get an overview of what you can choose from. The cost of material and installation apart, choosing the right kitchen flooring also needs to factor in how you will use your new floor and its durability. A variety of materials are available, ranging from vinyl tiles and sheets, linoleum, ceramic tiles, laminates and wood. 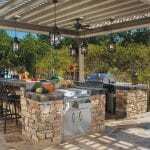 Again, depending on where you live and the size of your kitchen, one option could be more advantageous than another. A lot of thought must go into selecting your kitchen flooring as it can make a big difference in the way your kitchen looks. The wrong flooring could easily turn a well-designed kitchen into an average looking one while the right flooring can highlight your carefully chosen kitchen countertops, cabinets and appliances. 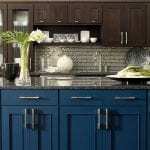 A tour of the model kitchens on display at these showrooms and a look at free samples of kitchen flooring materials can give you an idea of how it will look. When you select the right quality kitchen flooring you can enjoy a lifetime of durability combined with beauty. Vinyl kitchen floor is universally popular, as are laminates. Most people look for flooring that can take plenty of wear and tear and if there are kids around, you might want to also consider resistance to spills. Flooring that is comfortable and durable is the aim of most homeowners. 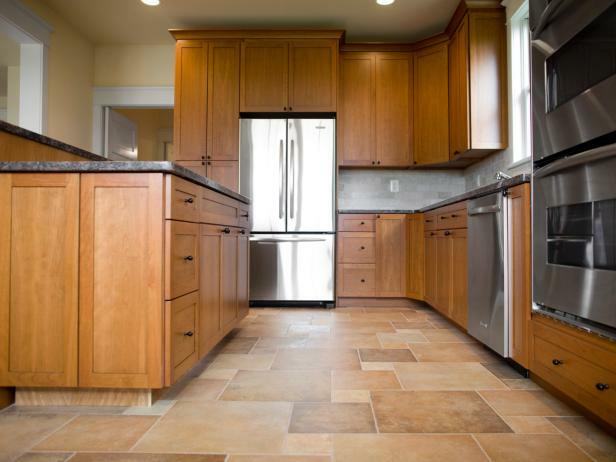 Getting the right kitchen flooring options for your kitchen flooring will depend on your budget and lifestyle. Vinyl Flooring -this is cost effective and durable and you can get it in sheets or tiles and in different finishes. Most homeowners go for vinyl for its wide range of colours, patterns and designs. Vinyl kitchen flooring is quite common, and you can get them in sheets or tiles. These can be installed quickly and are easy to maintain. Vinyl is long lasting and ideal for those who are budget-conscious. Different qualities are also available in vinyl flooring. The higher end vinyl flooring comes with a layer of urethane to make them retain their shine. While vinyl sheets need professional installation, the tiles are relatively easy for anyone to install. 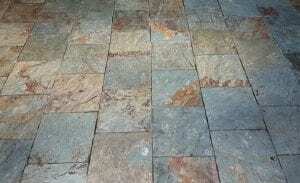 Ceramic Tile Flooring –these are also cost effective and sturdy. 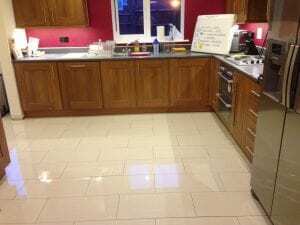 Tiles are easy to clean and maintain. Quite sturdy and attractive, ceramic tile kitchen floors are very easy to maintain. The stone type ceramic can give you a beautiful kitchen floor. Depending on where you live, the cost could vary. The stone ceramic tiles are sliced from boulders, so you might get that ethnic look with the flooring. 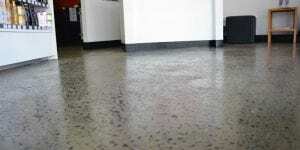 Concrete Flooring -durable and long lasting. Concrete kitchen flooring is the kind that used to be considered rather boring, but not anymore. These days, you can get your concrete floor treated to look decorative. The best thing about concrete kitchen floors is the ease of laying it. Invariably most types of flooring have a concrete layer under them. The advantage is, they don’t heat up and they keep your kitchen cool. If you have underfloor radiant heating, then concrete is the ideal floor. To make the concrete attractive, it can be stained to get the look you want. Easy to maintain, you get get your concrete to look like tile, hardwood, slate or marble floors but without the related expense. These floors can even be laid without professional help. Once stained, the concrete floor is sealed with wax and sealant to make it get a good finish. 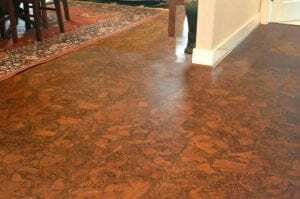 Cork Flooring -easy under foot and environmentally friendly. Cork kitchen flooring is another recent trend. Though on the expensive side, most people think it is worth every cent. It looks unique and can take the kind of finish you want. It feels good under your feet. Cork also has antimicrobial properties, making it a good choice in the kitchen especially where you prepare food. Most families appreciate cork floors most when something is dropped on it and stays intact without breaking. For busy cooks, cork also helps cushion the feet. Laminate Flooring –This trendy flooring idea that is easy to install and is also durable. 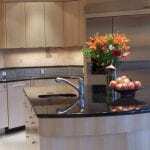 Laminate Kitchen Floors are among the most popular. These synthetic floors can be made to look like whatever type of flooring you want. Laminate floors are made with actual photos. 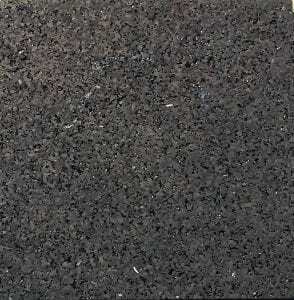 Several layers of material with a tough plastic layer on top makes up a laminate kitchen floor. You can laminate over an existing floor. These floors are durable when installed properly. Bamboo Flooring –this is a hot trend in kitchen flooring today for its beautiful looks and as a better option in terms of cost, to hardwood floors. Bamboo is strong, grows quickly, and is easily available. The bamboo kitchen floor is the hot new trend in kitchen flooring and is environmentally friendly as well. Cost wise, it is much less than hardwood, which is expensive. It looks beautiful and warm. Bamboo is a fast-growing grass that can be cultivated and matures in a much shorter time than other woods. Linoleum Flooring -inexpensive and easy to install. One of the oldest types of floors, linoleum kitchen floors are made from natural ingredients like linseed oil, wood powder, pine resin, etc. These floors are very budget friendly and can be made in different finishes like matte and marbleized patterns to give it that nice retro look. Rubber Flooring -durable and loads of options. Ask any chef and you will be told that rubber kitchen flooring is the best. Rubber flooring last long, are easy to clean and can take a rough beating. You can have them in the colours of your choice. 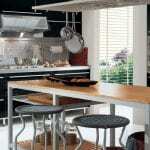 For those who spend a lot of time in the kitchen, rubber flooring is comfortable on the feet. Slate Flooring -beautiful and functional. Slate kitchen floorings are made of non-porous rock material and do not stain. Plenty of colours are available in this good-looking flooring, with the most popular being black, gray, rust, greens and maroons. Slate is also slip resistant. Travertine Flooring -durable and easy to install. Travertine kitchen floors are stone floors available in different colours and rough or smooth texture, depending on what you like. 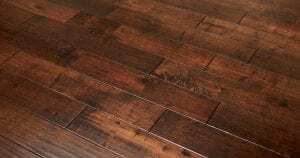 These are sturdy flooring material and can even withstand an acid cleaning. 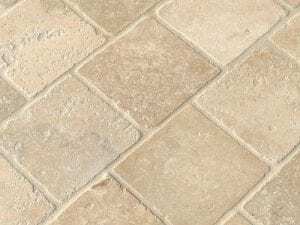 Italian travertine is considered good. 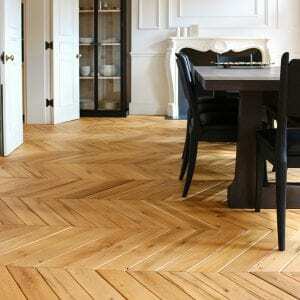 Wood Flooring –is very long lasting, although it needs maintenance. These are installed as strips, squares or planks and can be bought in different grains and colours. 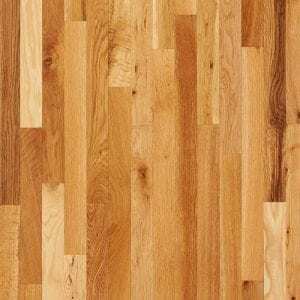 Hardwood Kitchen Flooring – Hardwood kitchen flooring is the kind of flooring option that lasts a lifetime and looks cozy. Best of all, it goes with just about any décor. Wood floors can be installed as strips, planks or parquet squares and you can choose what you like in terms of colors and grain. Kitchen floors tend to get lots of traffic and depending on what you choose might need to be replaced often. With the choices available today, you can find one that is both durable and looks good, lasting almost a lifetime. More and more people are opting for the natural look, going in for large marble or porcelain tiles where the grout lines are almost invisible. These colours are natural light earthy shades like beige and cream with a buffed finish. This kind of flooring is often maintained throughout the house. Wood floors, especially the darker shades like cherry, walnut, mahogany etc are being used along with stone in many homes. Materials that complement each other yet contrast are being used. Even vinyl and linoleum are quite popular as they are as dependable as wood. Ultimately, the choice of our kitchen floor mirrors your taste, your budget, and your requirements. 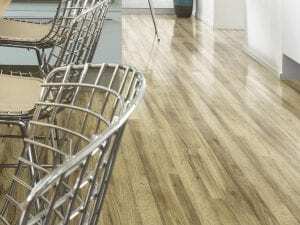 Going in for environmentally friendly flooring is the current trend. It is not mandatory that your entire home should have the same flooring. After all, the kitchen takes a lot more traffic than other parts of the house, so you might want to think about that. Here are some design tips to choose your flooring. If you go in for light shades in colour, your kitchen will look larger and brighter. Darker shades appear warmer and cosier. Here the kitchen flooring’s finish plays a role as well. Glossy floors look spacious while matte finish can make your kitchen look compact. For several small places with divisions, you can have the same flooring throughout for uniformity. Some kitchen floors have dramatic patterns while some are made in bright colours. Strong colours look good in smaller kitchens. Kitchen floorings must be practical yet stylish, so you need to choose something that looks good as well as wears well.